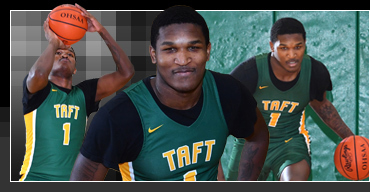 Taft high school senior Chris'seon Stringer is a two-sport all-star in basketball and football. In basketball, Taft is this year's CMAC Red Division tri-champions with a league record of 8-2. The Senators are also Div. II Sectional champs and District runners-up at 19-4 over all. Chris'seon, averaging about 16 points a game, helped the Senators win tough back-to-back games versus two defending state champions - Deer Park and Covington Catholic, in which he scored 13 points and 14 points, respectively. He also put up 17 points vs. Woodward and 15 points each vs. Hughes, Covington Catholic and Shroder. He scored 22 points in the big Sectional title game win vs. Hughes. He was named first team all-CMAC for the 2nd time and third team all-SWO District in Div. II. Last season, the Senators were outright league champions going 9-1 in league play, 17-7 over all. He averaged 21.7 points (second in the league), 6.6 rebounds and 3.3 assists per game, and was named 1st team all-CMAC, 2nd team all-city Div. II (Enquirer), 2nd team SWO District Div. II and honorable mention all-state Div. II. A football receiver this past season for the 8-2 CMAC champions (5-0 in league play), he had 29 receptions for a league-leading 544 yards and six TDs, plus he rushed for another TD. On defense, he had 38 total tackles and three interceptions. He was named 1st team all-CMAC for the third time, 1st team SWO District Div. IV, and special mention all-Ohio Div. IV. Chris'seon will play football collegiately at the University of Toledo. His favorite athlete is LeBron James, favorite entertainer is Kevin Hart, favorite book is Of Mice and Men, favorite movie is Friday and most-like-to-meet is Zendaya Coleman. COACH'S QUOTE – "Chris'seon is a leader on and off the court. He wants to be the best and pushes for the best from his teammates."